Descend the cliff face to the base of Victoria Falls on this abseiling adventure that combines adrenaline with unparalleled views of the waterfall, Victoria Falls Bridge, and the Boiling Pot. 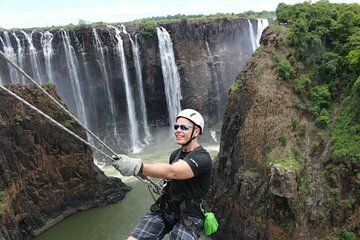 Begin the excursion with classic views of Victoria Falls on a tour through the park on way to the abseiling location. Then, secured in a full body harness, experience the rush of repelling in front of the thundering falls.